HKT the name says it all which only promises to deliver high-quality products that are reliable and durable. One of the trustworthy name in the technology world. 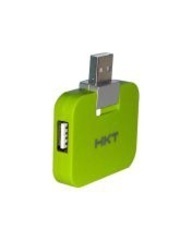 HKT USB Hub gives you a chance to associate four USB drives to a PC framework at one point. Enjoy this miracle USB hub which allow you to be multitasking. Grab this for good service and amazing experience!